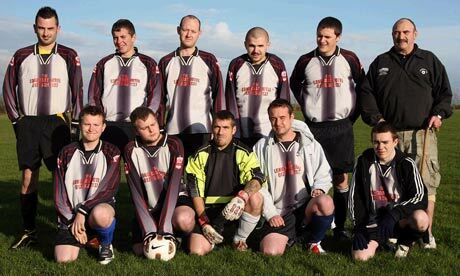 The worst football team in Britain? It can't be a heartening experience for any football team, picking the ball out of the back of your net once every 4.36 minutes. 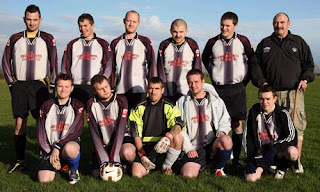 But on average, since the start of the season, that's what the first team of Madron FC, near Penzance, have had to do. After losing their opening matches in the first division of Cornwall's Mining League by the relatively modest margins of 11-0, 4-1 and 16-0, they slumped to 27-0 and 27-1 defeats before succumbing, two sorry Saturdays ago, to a monumental 55-0 thrashing. In 11 matches this season, says stand-in team manager Alan Davenport, Madron have scored two goals and conceded 227. It's a degree of sporting incompetence that has won the team admiring mentions not just in the national press, but in sporting newspapers as far afield as France, Italy and even Brazil. But Davenport, who's also the club's secretary, treasurer and chairman, is not letting it get him down. "Morale's high," he says. "Heads are up. We're getting better." A dispute over money lies at the root of the club's troubles. At the start of this season, its newly promoted first team walked out en masse when Davenport informed them they had to pay their subs. "Fourteen players – guys who hadn't lost a single match the whole of last season – just upped and left," he says. "Their manager had told them that they needn't pay, but we're a very small club . . . So I then had to put a scratch team together. For the first division." The coach decided it would not be fair to plunder the club's second team, which could win its division this season. "So we played with who we could get," he says. "Unfortunately, that mostly means lads of 16 or 17 who haven't really played football before and can't get a game anywhere else. Often there aren't enough of them, either. In 11 games, we've fielded three full teams." Since that 55-0 drubbing, however, for which the team mustered seven players but no goalie ("One lad did stand between the posts," says Davenport, "but he spent the game chatting to his mates"), things could be looking up. Last Saturday, Madron lost 22-0 – but they fielded 12 players, and the goalie saved two penalties. "Today alone, I had calls from three lads who want to play with us," says Davenport. "22-0 isn't brilliant. But it's 33 goals better than last time. This weekend, we might get a point. We're not giving up." kdg2 kita kena kasihan jgk kat pihak lawan..
55-0 tu.. haha.. pastu main 12 org pun kalah 22-0.. ape pny team la ni..
Inilah cara untuk glamer... depa tu saja jer kasi can sebab dengan cara macam ni ler baru oarang kenal pasukan depa.. tak gitu?? ?